Next post: Which Came First — Flatcats? or Tribbles? Three weeks and counting. If you ‘maniacs run true to form, you’ll swallow it in one big gulp and immediately start asking when the next one’s coming. Fortunately for you, mine isn’t the only book debuting next month. 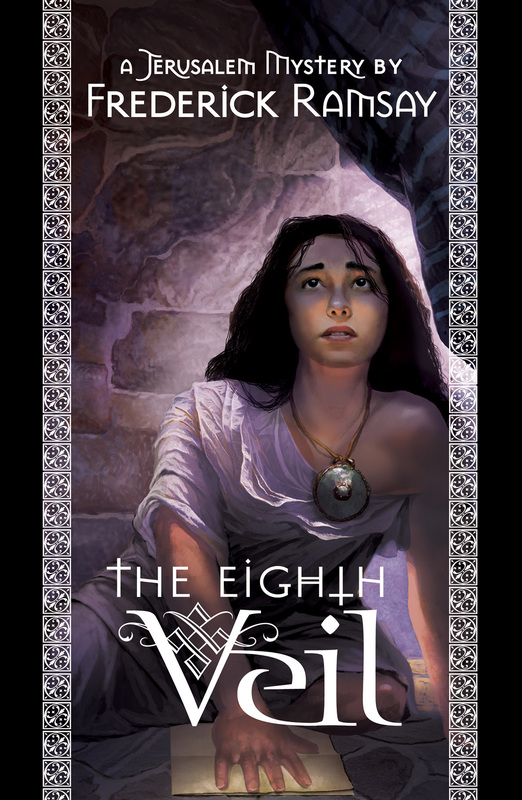 I direct your attention to a little gem of a mystery written by Frederick Ramsay, coming out from Poisoned Pen Press, called The Eighth Veil. I trust you’ll remember Salome of the seven veils? Keep her in mind as you read on. It’s Jerusalem, 26 AD. A serving girl in Herod Antiphas’ palace has been raped and murdered. The local Roman prefect, one Pontius Pilate, summons Gamaliel the Elder to squelch this scandal before it makes Rome’s hand-picked satrap look bad. Or, let us say, any worse than Herod and his promiscuous, fratricidal family have made themselves look already. Gamaliel, chief rabbi of the Sanhedrin, does his level best to refuse the call to adventure, but Pilate is insistent. He bestows his ring on Gamaliel as a symbol of the Prefect’s absolute authority and charges him with the task of either finding the girl’s murderer, or, even better, a reasonable facsimile thereof so the girl and her story can be buried and forgotten. Gamaliel, alas, has the habit of honesty, and it leads him not to bury the girl but to raise her. Sorry, of course I mean metaphorically, but with even the dead girl’s true name in doubt and a royally sponsored conspiracy of silence surrounding her death, he must first learn who she truly is before he can discover who killed her, and why. …all the information I have just supplied cannot be verified and may not bear in any way on the circumstances of the girl’s death. My spies in this matter are less than trustworthy and their reports often contradictory. It is the nature of the politically motivated to spread misinformation more readily than the truth. So, everything I have just said may be completely false and misleading and deliberately so. I kinda like Pilate, too. The girl’s body is not the only thing decaying in The Eighth Veil. The ruling family of Judea is destroying itself through internicine warfare, the Jewish church is creating the very seeds of the Christian schism to come, and Rome rots from the head down under a series of corrupt Caesars who pay too little attention to rumors of rebellion in the provinces. It is a period of profound flux that will reshape the world as Gamaliel knows it. An interesting tale on many levels, and entertaining on every one. And I’m sure any parallels you might find between the world of Gamaliel then and ours today are entirely coincidental. Click here to reserve your copy from the Poisoned Pen Bookstore. *You won’t get the title of my review until you read the book. Of COURSE we will read Kate 19 (with Liam) in one sitting and then start begging for more! Would a true ‘maniac do otherwise? But this one looks good, Dana. So good that I just added it to my “to buy” list. Ooh. That sounds good. Thank you. Pre-ordered, and now I have another thing to whine about waiting to debut. I have read his “Judas”, and liked it very much!